Ranking just after San Francisco and New York City, Boston was the 3rd most expensive rental market in the nation this month. The price of one bedroom units grew 1.4% to a median of $2,250, while two bedroom units jumped 4% to $2,600. 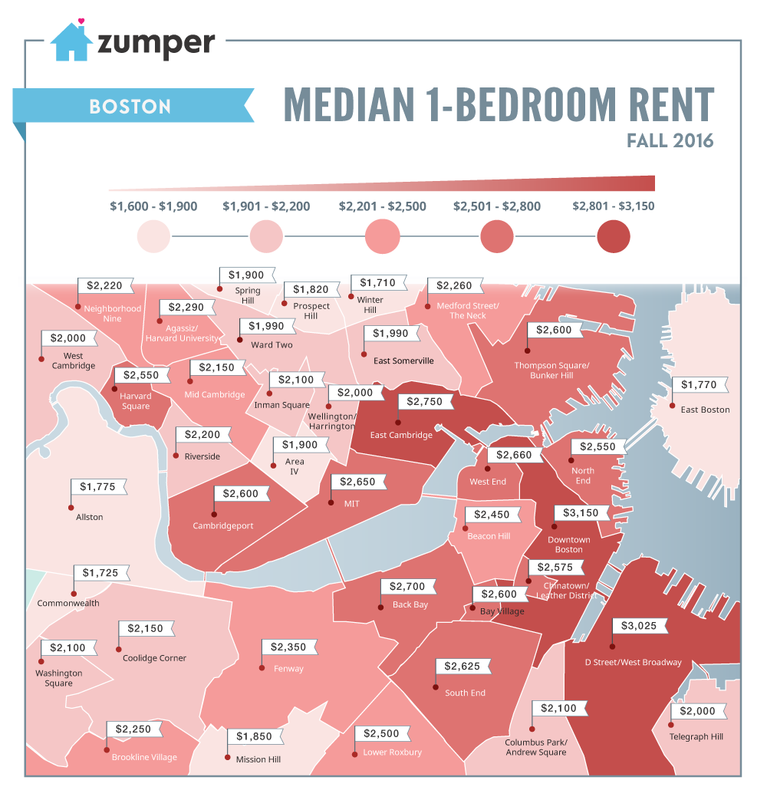 Ranging between $2,700 – $3,150 a month for one bedroom units, Downtown Boston, D Street – West Broadway, and Back Baywere the most expensive Boston neighborhoods this fall. Mid-range priced rentals for less than $2,300 could be found in Telegraph Hill, Columbus Park – Andrew Square, and Brookline Village. Just across the river, East Cambridge ($2,750), MIT ($$2,650), and Cambridgeport ($2,600) were the priciest rental areas in neighboring Cambridge. To see how Boston rents compare with the rest of the nation’s, view our October National Rent Report, which analyzes over 1 million active listings to identify rental trends across the 100 largest U.S. cities. Stay up to date with rental changes across the country by following us on Facebook, Twitter, or Pinterest. In the market for a new place? Search over 5,800 Boston apartments on Zumper right now.